Baltimore, MD-Police in riot gear forms a line to impress protestors right before the curfew time while demanding the protesters to go home. Baltimore, MD- A man was arrested for disorderly conduct by the Baltimore Police Department. 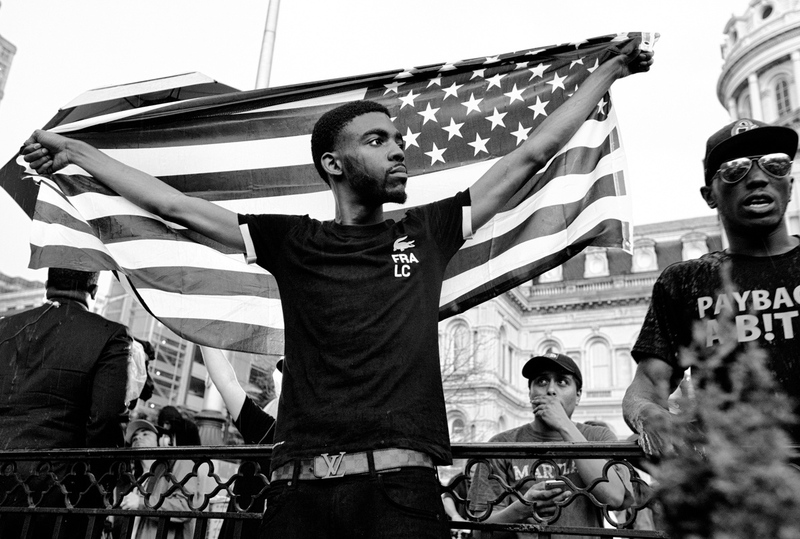 Baltimore, Md- A young protester holds the American Flag during the March For Peace. 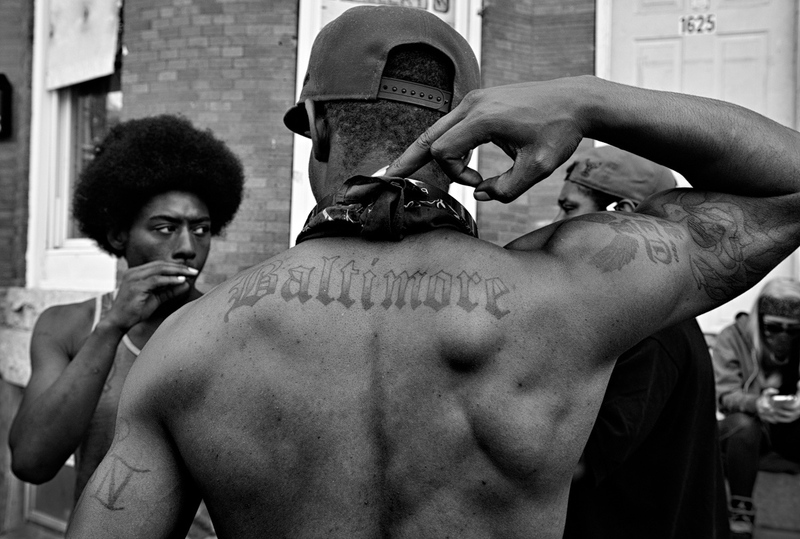 Baltimore, MD-Member of the Bloods gang showing his tattoo and sign while a member of the Crips gang looks on. They spoke about the unity of the two rival gangs resulting from the death of Freddie Gray. 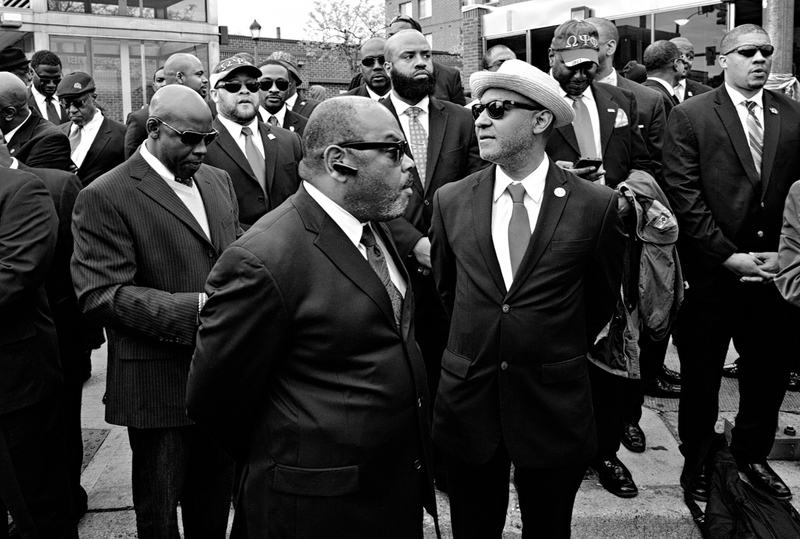 Baltimore, Md- Members of the Omega Psi Alpha fraternity joining the protests. 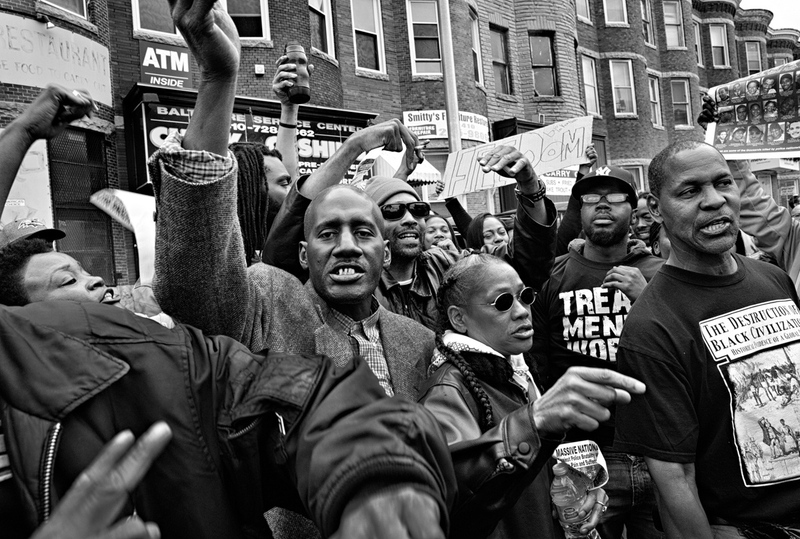 Baltimore, Md-Protesters on the streets celebrate criminal charges filed against the six police officers involved in the death of Freddie Gray. Baltimore, MD- A resident on his way to work. 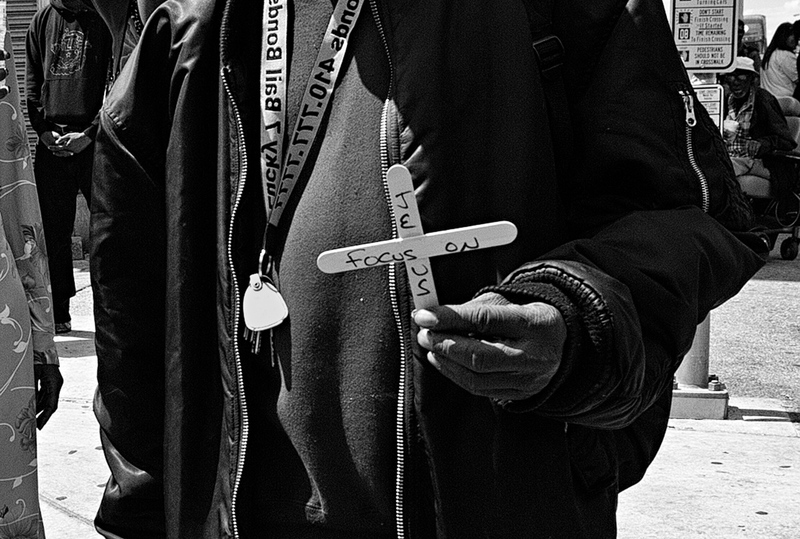 Baltimore, MD- A protester holds out his makeshift sign of his faith. 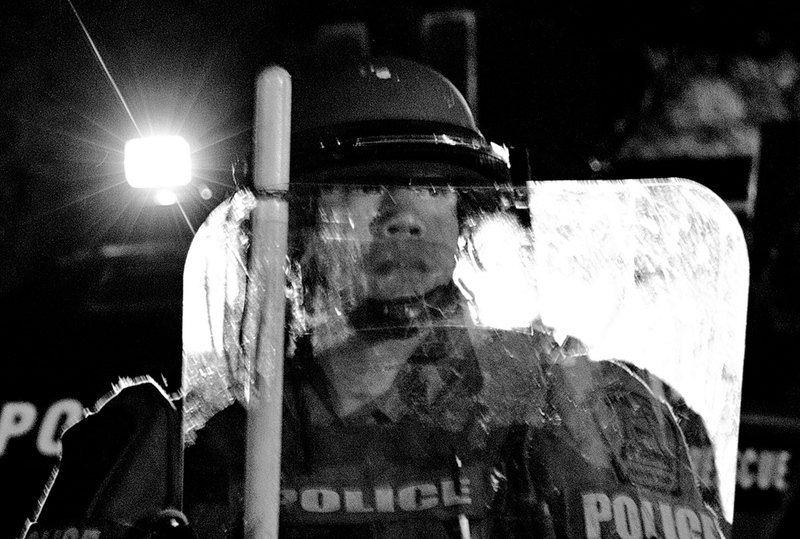 Baltimore, MD- Police in riot gear was ever present throughout the protests. 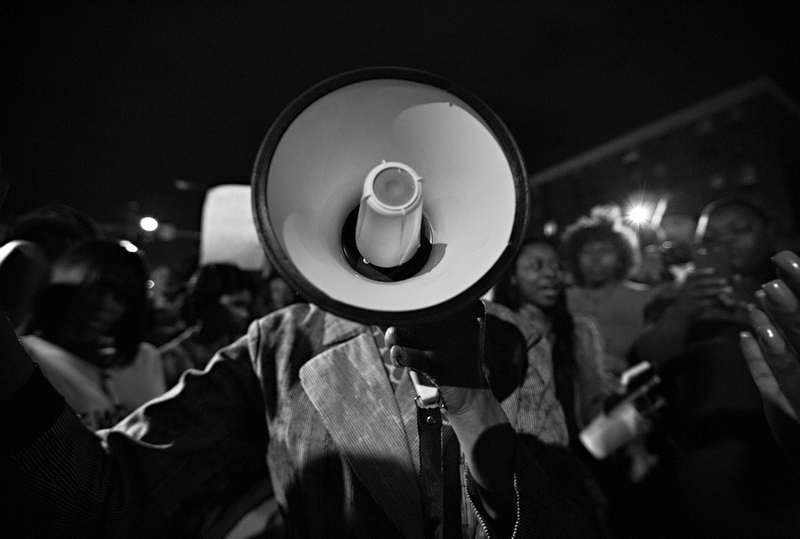 Baltimore, MD- State Senator Majority Leader Catherine Pugh (D) using the bullhorn to ask protesters to comply with the 10:00 PM curfew and go home to avoid conflict with the police. Baltimore, MD- Residents joining arms to create a buffer between the National Guard and the protesters after the 10:00 PM curfew. 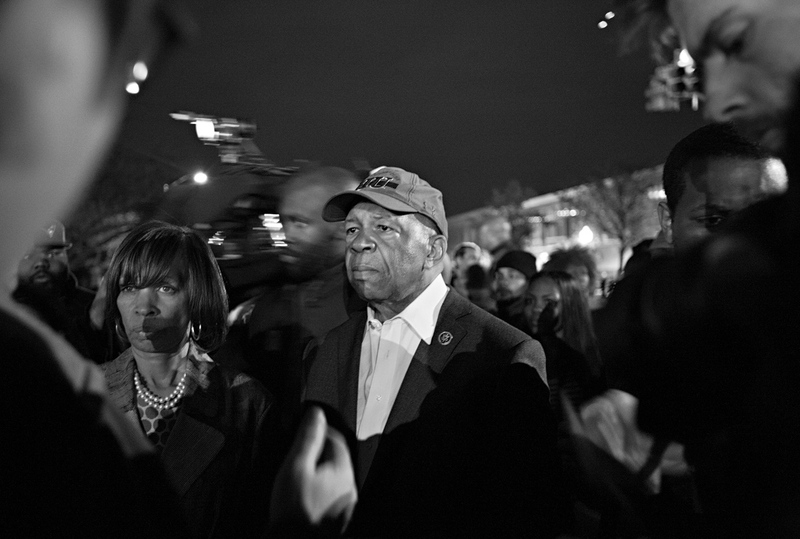 Baltimore, MD- Congressman Elijah Cummings (D) representing the 7th District was present on the scene every night at curfew time inviting the protestors to comply and go home and avoid any conflict with the police. Baltimore, MD- A sign left behind after the protests. 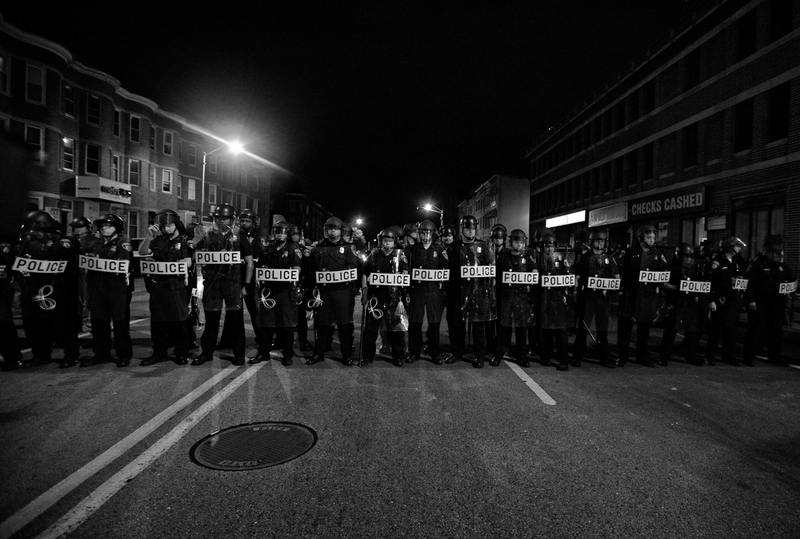 Baltimore, MD-Police in riot gear demanding the protesters to go home after the 10:00 PM curfew. 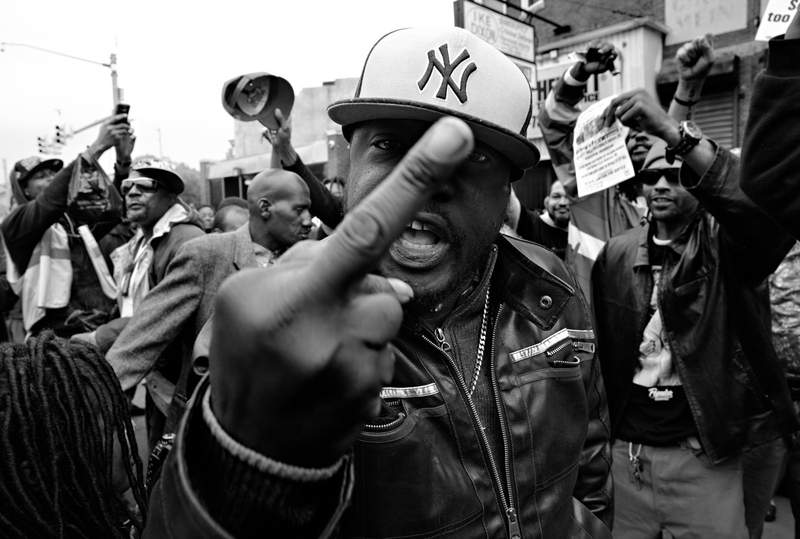 Baltimore, MD- A resident expressing his feelings towards the Police in celebration of the decision by the Attorney General to file criminal charges against the six police officers involved in the death of Freddie Gray. Baltimore, MD- Protesters celebrating criminal charges brought against the six police officers involved in the death of Freddie Gray. 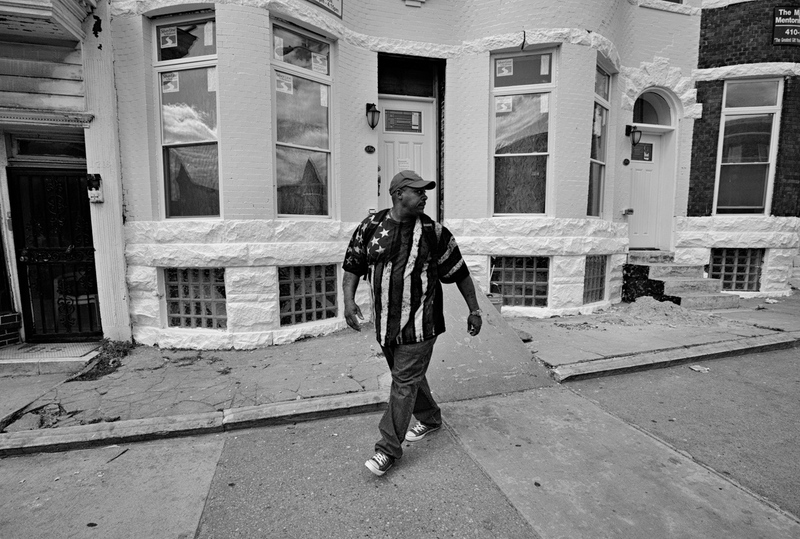 Baltimore, MD- The neighborhood around where Freddie Gray was arrested consist of row houses where 1/3 of the properties are abandoned, boarded up, condemned or burnt down. Although none of this prevents residents to live in these row houses. 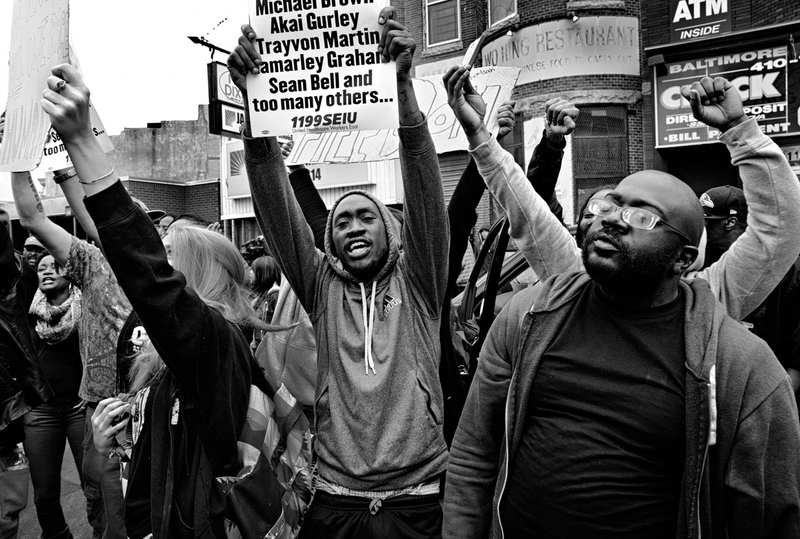 Baltimore, Maryland was the scene of civil unrest in April and May 2015. It all started with the evidently unprovoked death of a young black man, named Freddie Gray, which was caused by six police officers: three of whom were white and three who were black. I drove to the City to experience first hand the events unfolding. 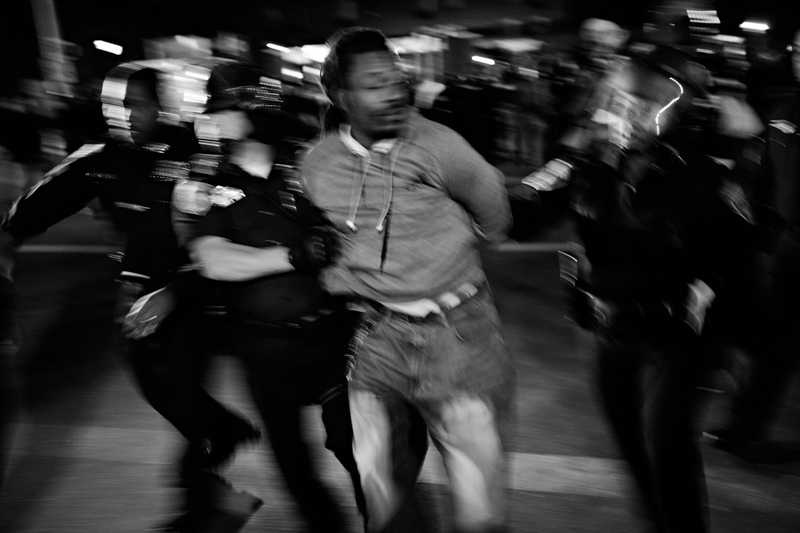 A resident asked me: “Why are you here?” My answer was simple—I was there to observe and not photograph “angry black men.” While these images were appearing on the mainstream media, I wanted to take a different approach. Still, I found this question important: why was I there? 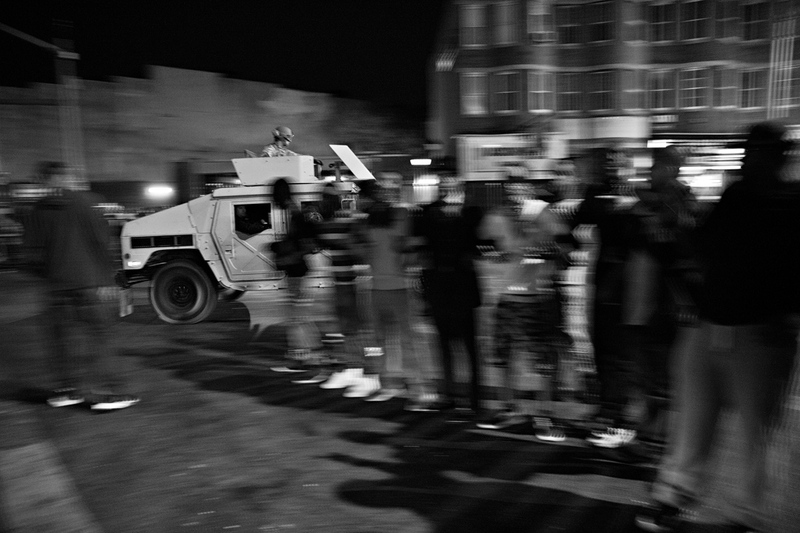 I knew I was there to photograph the Baltimore protests and turmoil but also I wanted to give some context to the underlying reasons why the unrest was taking place. In my observation, the issue of race is not the primary factor. Instead, it is one of class struggle. 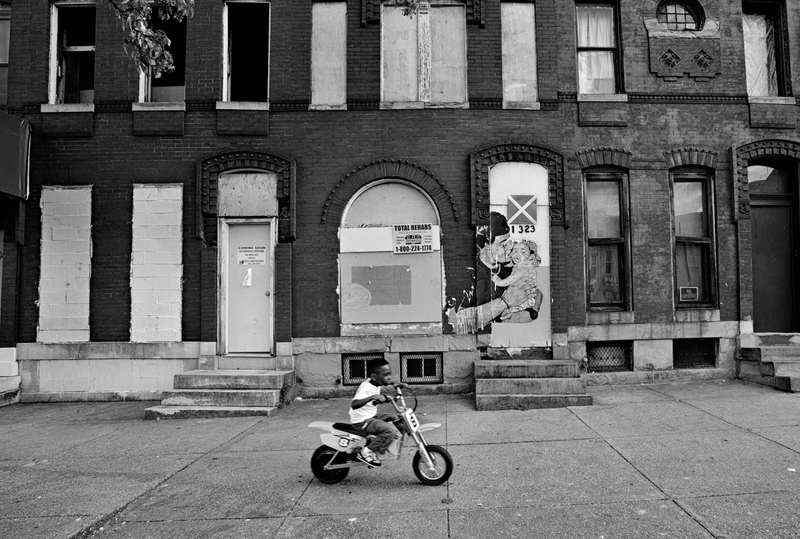 The Baltimore slums, the location of Freddie Gray’s arrest and resulting civil unrest, is home to a majority African-American community that appears to have been abandoned by society at large. The streets of this neighborhood are lined with abandoned homes. Boarded up and burnt out structures remain standing next to dilapidated row houses that are home to many families and children. 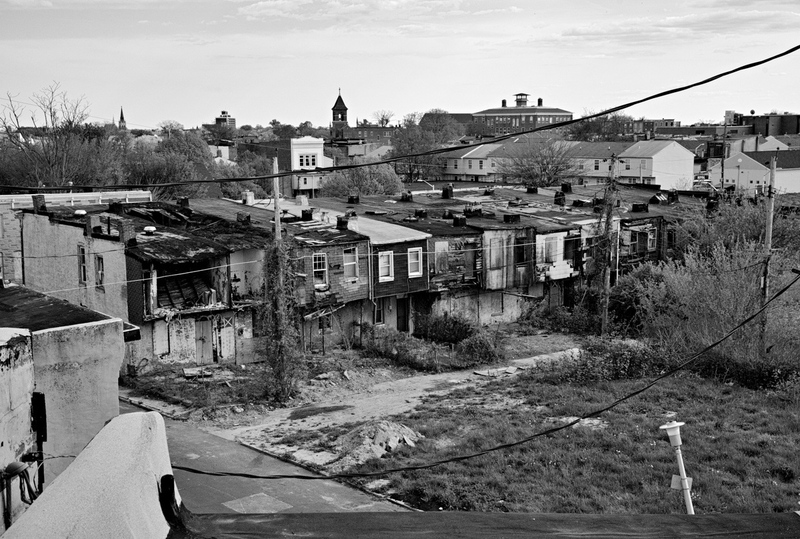 The plight of these Baltimore residents can be found in some parts of most American cities. These are crime-ridden, hopeless places that are only “kept in line” through the brutal force of their respective city’s police departments. I found it notable that a Bloods gang lieutenant told me that their unity with the rival Crips gang was causing concern for the police force. The thinking was that if the gang members were not fighting and killing each other, they would be twice as strong in their opposition to the powers in charge. The news indicated that the Baltimore African-American community is experiencing a 37% unemployment rate. It may not be enough for the government to simply provide affordable housing, as they have, if the residents of these communities are not employed. Many of these people are economically marginalized and thus do not feel like productive members of the society in which they live. Where there is so much hopelessness coupled with a sense of unfairness and powerlessness, unrest and violence appear to be the inevitable results. In the neighborhood where Freddie Gray was killed, I did not see one grocery store. Instead, bail bonds offices, easy loan stores, liquor stores and corner stores filled with junk food. What kind of a future can the children—and there were many—growing up in these slums expect? When will the next violent uprising occur? 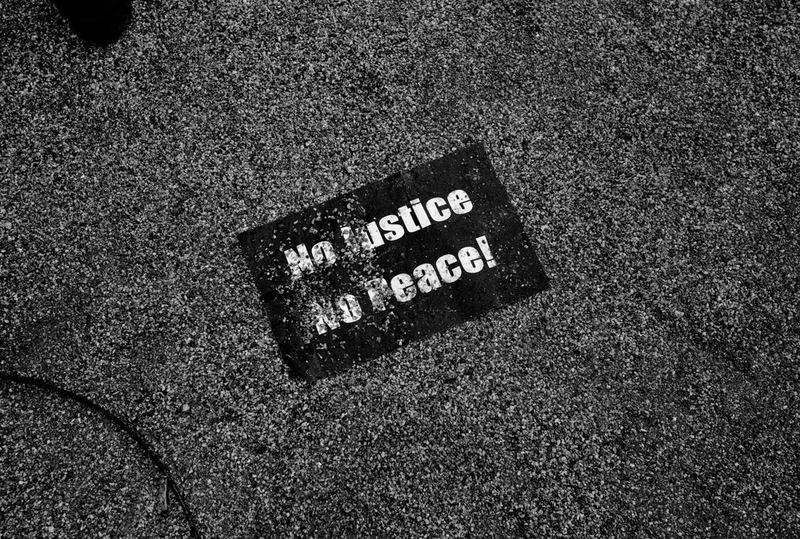 In the end, the chant “No Justice, No Peace” resonated strongly with me. 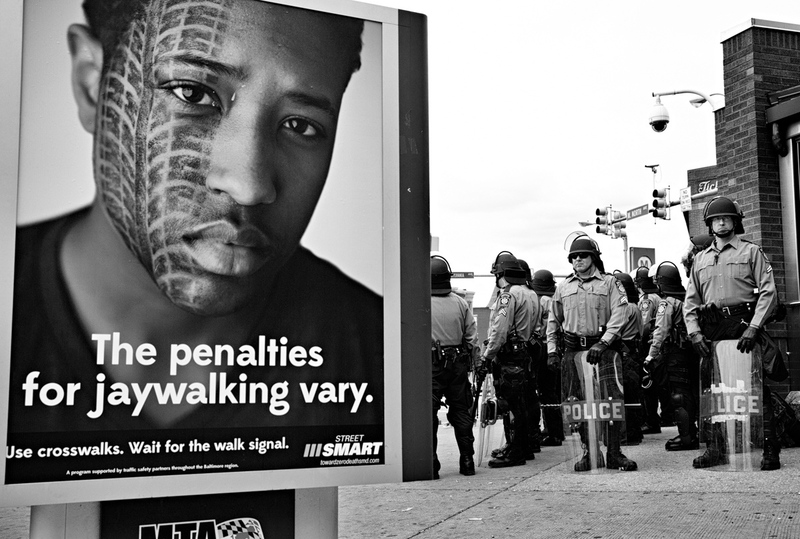 While criminal justice is primal, economic justice is also an integral part of the puzzle. Should it ever become a reality, that’s what will most likely lead to peace. By Nima Taradji Photography — In Sidney, Ohio school and public safety officials have worked together over the last five years to develop an all-volunteer first responder team..
By Nima Taradji Photography — The ninth annual C2E2 Expo wraps up at the McCormick Place in Chicago, Illinois. The Chicago Comic and Entertainment Expo, also known as C2E2, is..
By Nima Taradji Photography — "This people has attained riches without usury, and all the honours that can be awarded to slavery without intrigue. But they have long..
By Nima Taradji Photography — One of the most unique and quintessential New Orleans traditions can be found played out every Sunday in the Second Line Parade. Rooted in the..
By Nima Taradji Photography — Lucky Seven refers to baby Ansel. After struggling through losses, Lori Sapio welcomed her “Second Rainbow Baby” on December 5,..
By Nima Taradji Photography — Family Ingredients Family is a recipe. It is a place where we teach our children how to cook. Family is where we come together. This series was..
By Nima Taradji Photography — Members of the Irshad Learning Center in Naperville, Illinois, gather to commemorate Ashura. Members of Irshad Learning Center are first and second..
By Nima Taradji Photography — Donald Trump, Hillary Clinton, Bernie Sanders, political rallies, media control, Democratic National Convention troubles with Bernie Sanders..
By Nima Taradji Photography — Sources “You were born a child of light’s wonderful secret— you return to the beauty you have always been.” ― Aberjhani, Visions of a..
By Nima Taradji Photography — In 2015, I started work on a personal project about Mexican Wrestling or Lucha Libre. This sport is unique in many ways, but most commonly..
By Nima Taradji Photography — The Inauguration of Donald J. Trump had for theme “Uniquely American.” It was held in Washington, DC from January 17 to 21, 2017 and was..
By Nima Taradji Photography — They are not protestors. In fact, they make sure you understand that they do not like to be referred to as “protestors”. They see..
By Nima Taradji Photography — They are not protestors. In fact, they make sure you understand that they do not like to be referred to as “protestors”. They see themselves as..
By Nima Taradji Photography — The Bud Billiken Parade and Picnic (also known as The Bud Billiken Day Parade) is an annual parade held since 1929 in the Bronzeville/Washington..
By Nima Taradji Photography — A roadtrip from Cleveland, Ohio to Philadelphia, Pennsylvania in summer of 2016. Two days to do the trip that would have otherwise taken about..
By Nima Taradji Photography — Since the 1990s, when the collapse of the Soviet Union (and the end of decades of subsidies to its communist outpost) saw Cuba descend into..
By Nima Taradji Photography — What I find funny about The Conventions is not really funny, but it is funny. 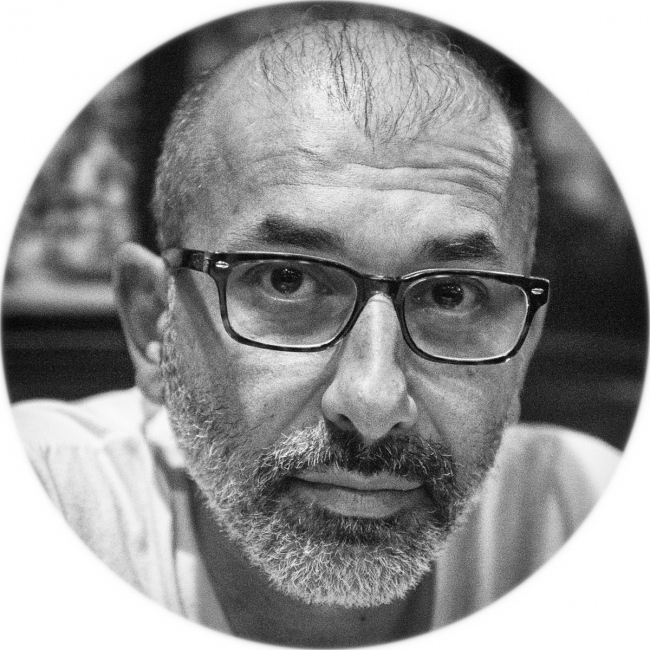 In fact, it would be really funny if it all was not so real and the..
By Nima Taradji Photography — Perched on the edge of Lake Michigan in Indiana, just south of Chicago, is the 6th largest refinery in the US, operated by BP. This BP refinery is..
By Nima Taradji Photography — " Burning Man is a week-long annual event that began in San Francisco's Baker Beach and migrated to the Black Rock Desert in northern Nevada,..
By Nima Taradji Photography — Behind the scenes at a fashion show is chaos. An army of people consisting of models, designers, hair stylists, make up artists and others who..
By Nima Taradji Photography — Since 2005, Lollapalooza has been the weekend destination festival for music lovers across the globe. Hundreds of thousands of enthusiasts..
By Nima Taradji Photography — Text by Hector Luis Alamo Lowrider culture began in the desert somewhere. Whether it started in the actual desert shared by El Paso, Texas..
By Nima Taradji Photography — Brave Ordinary Things This is an ongoing project which started in 2006 and aims to show the concept of that which is unique in the midst of the..
By Nima Taradji Photography — Note: Essay contains explicit content. Delia Marie K. (Dee), born David Murray K., experienced several marriages and several divorces, a major..
By Nima Taradji Photography — Red Hot Annie, the founder and CE-Oh of the Vaudezilla Productions and Burlesque in Chicago since 2008 created one of the most successful burlesque..
By Nima Taradji Photography — Via Crucis or The Living Stations of the Cross is the re-enactment of Jesus Christ’s crucifixion. It has taken place since 1977 in the Pilsen..
By Nima Taradji Photography — “You were born a child of light’s wonderful secret— you return to the beauty you have always been.” ― Aberjhani, Visions of a..